Did you ever wonder about the difference between a hotel and a hôtel. Well, I suppose it's like they say: if you have to ask you don't need to ask... 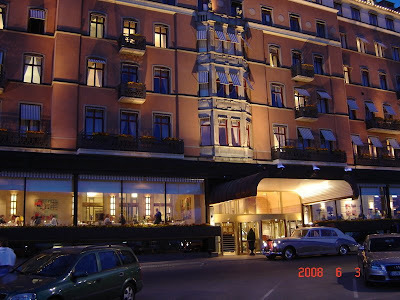 This is the Grand Hôtel at Blasieholmen, fully equipped with five stars and the lot. Comes complete with a Rolls-Royce at the door! I hardly recognised it except for balconies. I don't think I really looked at the reception area (probably blocked by parked vehicles) and of course the evening lights make a great difference. Didn't know that was a Rolls, Peter! Most appropriate at this particular address, I'd say. I remembered your post and made a point of returning at a different time of day, Gerald. Thanks guys for commenting. We might have another shot of the Grand later on.